You’ve seen how the story began and what hardships have been overcome… tune in right here, right now for the thrilling conclusion to the epic paint rack trilogy! You can read the details of why I started this project in the first post, and you can read about some of the trouble I ran into getting my materials in the second post. After all that, I finally managed to get my materials all cut into the right shapes and sizes, and I was ready to begin putting together my paint rack. The first thing I did — the first thing anybody should always do, before they spend a lot of time building — was to inspect my materials. I was pretty satisfied with the cut pieces of prelaminated chipboard. There was some chipping of the laminate layer near the cuts, but that’s really kind of inevitable with these kinds of material if you don’t have anything below and/or above the material you’re cutting. to help prevent it. Perhaps I could have insisted that they take extra care to do so, but I was already happy enough I had the ability to get my materials cut to begin with, so I’m okay with this. I’d already designed the paint rack in such a way that all of the edges likely to have bits of the laminate layer chipped off are all in the back, where it’s much less noticeable. Compare the edges. Much better! Next, I had to place all of the plank holders — the lil’ wood things! I had to place all of them 3.6 centimeters apart. I didn’t pick that number by accident. All of these prelaminated chipboard panels are actually 1.8 cm thick. What that means is that once I had the bottom two plank holders glued in place (with fast-drying adhesive caulk) I was able to just take two scrap pieces and put them side-by-side next to the first set of plank holders, and use place the next set of plank holders on the other side. Due to slight variations in positioning and how each peace of wood is naturally just a little bit difference or may have some micro-warp, it may not be always result in a perfect 3.6 centimeters… but it’s close enough for the purposes of this project. And it’s much faster than taking constant measurements! I still had to wait many times for the adhesive caulk to dry, which slowed me down again… but at the very least it was less of a chore doing it this way. Now, some people might have called it quits here, but I’m the kind of guy who wants to trust his paints to a single point of failure. And as far as I’m concerned, that’s what the adhesive caulking is. So from the very start, I’d actually planned to use screws as well. I’d bought the right screws for this project ahead of time. The only problem? Wood likes to break and splinter into large chunks if you drill a screw directly into it. Some people are surprised that this is a thing, but it’s really not that surprising when you think about what you’re actually doing if you’re driving a screw into the wood directly. You’re pushing the screw in and that’s literally trying to split the wood to make room for that screw. But once it begins splitting, it likes to split all the way following the grain, which is its weakest point. Notice that there’s actually a lot of space in there. The drill bit’s clever design creates a hole in the wood and immediately scoops up the wood chips it creates. This removes the excess wood, thus avoiding cracks – rather than trying to push it inward and downward, which will cause splits very easily. A bit of a tangent, perhaps – but the point is, if I was going to put in screws, I was going to have to drill some holes for them first. Did you count them? The number of plank holders? I’ll save you the trouble: there’s 66 of them. This, uh… took me a while…. it would take anyone a while, but especially if you already have trouble with your joints and back. Funnily enough, it’s holding down the trigger on the drill that was the worst… by the end of it, I was having to use two fingers for it to still drill. But I did it! I can put in the screws now! Right? … right? See, the screws all taper at the top. And guess what happens if you drill a screw like that into the wood directly? Yuuup, you’ve got it. It’s the same story as I’ve explained above. It’ll push into the wood, which not having anywhere to go, will very likely split and break. 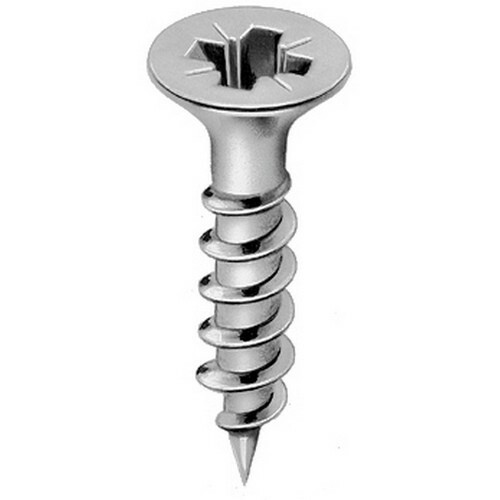 These are specifically designed for this exact purpose: to create a slightly larger hole at the top of a pre-drill hole so that the screw that’s going to be driven in there can sink neatly into the wood. Of course, I don’t have any countersink drill bits. But hey, if you ever find yourself in that situation, you can also improvise by just taking a regular drill bit that’s a tiny bit larger than the diameter of the head of your screw, and using that to manually drill a larger hole on top of your existing hole, just enough for the screw to be able to sink in underneath the surface of the wood. That’s what I did! So after cleaning out all of that wood dust with my trusty vacuum, I was finally able to… wait, damn it. I have to get out that drill again, don’t I? After 132 holes… and 132 other holes… I have to actually put in the 132 screws. Yeah. I did have to do that. And I did to that! So it took close to 400 drill and screw actions, but I’d finally managed to get all 66 of the plank holders into place, with both adhesive caulk and screws, and neatly. The next step was to allow the lower and upper horizontal structural planks to be placed. Since these are structurally important, they’re being attached with 4cm thick steel brackets, which had to go into place first. By putting the entire work-in-process in a corner of the room adjacent to other straight things that are at a 90 degree angle relative to one another, it makes it really easy to get the right shape and angle without worrying excessively over it or taking measurements every other second. Careful observers may note that I actually have the entire thing upside-down here. That’s not an accident, it’s deliberate. The next step was to attach the white hardboard as a back-panel. Remember those cut-outs on the bottom of the paint rack to accommodate for the wall’s baseboard? Obviously I can’t have the baseboard go all the way down for the same reason. The hardboard back-panel has to be about 5cm off the ground. You could spend a lot of time trying to come up with ways to lift the hardboard and keep it in place…. or you could simply flip the paint rack so you can have the hardboard resting on the floor as you attach it to all the sides, which is what I did. It makes things way easier. But by having a back-panel that’s attached to all four sides, it actually helps hold all sides in place relative to each other. In simpler terms… it helps keep everything standing up straight. I put the on back-panel, then flipped it back right-side-up. I then pushed it into its final place behind the door. I was especially pleased with the perfect fit. Unfortunately, the sloped floor did cause some issues, but I was able to sand down one of the spare plank-carrying-planks to help lift the left side of the paint rack so that it is completely level. Fun fact: I couldn’t screw into the wall there. It’s a US-style wall, which is to say a textured sheet of drywall with nothing inside it. So what I did to make sure it would stay upright is to screw it into the doorframe on the left side, and into the ceiling’s structural beam on the right. For the left side, conveniently, that steel bracket was in exactly the right place, so I actually took out a screw and replaced it with a much longer and slightly thicker screw that went straight through the vertical plank and a couple of centimeters into the door frame. Since you’re already expecting to see screws in that steel bracket, you don’t even notice this. The right side was a bit more challenging. I had my dad bend a smaller steel corner bracket into shape for me, and connected that to the outside of the paint rack, and the bottom of the ceiling frame beam. It’s kind of noticable from this angle, but you’re not normally in a position to really see it much at all, so I was okay with this. With the paint rack in place, there was only one major thing left to do… add the horizontal planks, and move all my paints-n-stuff into this rack! Personally, I’m incredibly happy with how this turned out. It’s almost exactly the way I’d planned, and it works beautifully. All of my paints and related materials are now close together, I can see what I have at a glance, and if I need anything, I can get to it right away. It’s in an area that would have been effectively useless for anything else. And best of all, I have an incredible amount of control over the height of each individual row, with the ability to add or remove a couple of centimeters whenever that’s needed. The only challenge that remained was to make sure the door wouldn’t slam into the paint rack. I ended up solving that pretty easily by using double-sided tape to glue down a tape-covered cork. As long as you’re not actively trying to throw the door into the paint rack, this is enough to prevent the door from knocking things over. The door can’t open as completely as it used to, but it’s still wide enough for anyone to come and go as they please… and given what I’ve gotten in return for it, I’m more than satisfied it was a worthwhile trade-off. Did you like this build, and seeing what went into it? What do you think of the results? Leave a reply and give a like and/or share on the NinjyProps socials! If you enjoyed this content, please consider making a donation! Every little bit helps! Don’t have a lot of money to spend? No problem! If you have video game guides; or art books for videogames, movies, anime, and so on, you can donate those too. They’re sure to be helpful in future projects! Check out the [_donation_page_] for more details!